Leading an active, engaged and balanced life is not only fun, it’s rewarding! 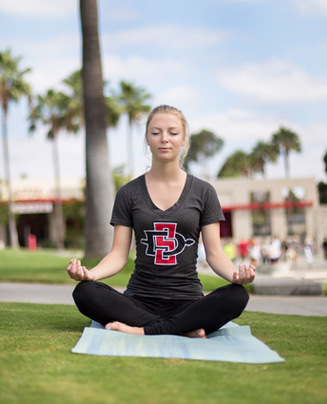 Whether it’s a program to learn a new relaxation technique, improve physical fitness, stay safe, or help a friend in need, the Live Well Aztecs initiative promotes the many resources available at SDSU. Live Well Aztecs is a collaboration of numerous departments which serve students, faculty and staff to support health, wellness, and well-being and enhance the Aztec Experience. The Live Well Aztecs initiative promotes a holistic model to educate about the balance of well-being. This Eight Dimensions of Wellness model includes, physical, spiritual, intellectual, multicultural, social, occupational, environmental and emotional wellness. Check the events and resources listed on this page and join in! Does your upcoming event have a wellness theme? Apply for your event to be a Live Well Aztecs Recognized Event! Here at SDSU, leading an active, engaged and balanced life is not only fun, it’s rewarding! The Live Well Aztecs initiative is a campus wide collaboration that combines many resources in order to promote health, wellness and well-being for students, faculty and staff. To further promote health and wellness, Live Well Aztecs has teamed up with SDSU Dining to allow making healthier choices easy! Food items labeled, “Live Well Aztecs Approved”, allow you to identify healthier choices such as foods that contain 100% whole grain, have lean protein (including seafood), as well as foods that are a good source of fruits and veggies and low in sodium, added sugars and saturated and trans fats.